Mohammadi Ziarani, G., Aleali, F., Lashgari, N., Badiei, A. (2016). An Efficient Green Approach for the Synthesis of Structurally Diversified Spirooxindoles Using Sulfonic Acid Functionalized Nanoporous Silica (SBA-Pr-SO3H). Iranian Journal of Chemistry and Chemical Engineering (IJCCE), 35(1), 17-23. Ghodsi Mohammadi Ziarani; Faezeh Aleali; Negar Lashgari; Alireza Badiei. "An Efficient Green Approach for the Synthesis of Structurally Diversified Spirooxindoles Using Sulfonic Acid Functionalized Nanoporous Silica (SBA-Pr-SO3H)". Iranian Journal of Chemistry and Chemical Engineering (IJCCE), 35, 1, 2016, 17-23. Mohammadi Ziarani, G., Aleali, F., Lashgari, N., Badiei, A. (2016). 'An Efficient Green Approach for the Synthesis of Structurally Diversified Spirooxindoles Using Sulfonic Acid Functionalized Nanoporous Silica (SBA-Pr-SO3H)', Iranian Journal of Chemistry and Chemical Engineering (IJCCE), 35(1), pp. 17-23. Mohammadi Ziarani, G., Aleali, F., Lashgari, N., Badiei, A. An Efficient Green Approach for the Synthesis of Structurally Diversified Spirooxindoles Using Sulfonic Acid Functionalized Nanoporous Silica (SBA-Pr-SO3H). 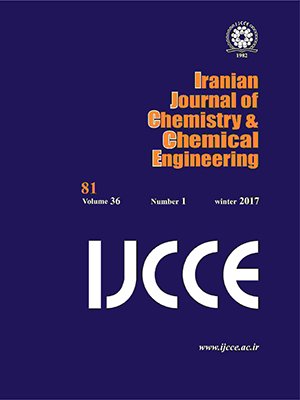 Iranian Journal of Chemistry and Chemical Engineering (IJCCE), 2016; 35(1): 17-23. One-pot multicomponent reaction between isatin, barbituric acid, and 6-amino-1,3-dimethyl uracil was investigated in the presence of sulfonic acid functionalized nanoporous silica (SBA-Pr-SO3H) and resulted in the formation of spirooxindole dipyrimidines. Spirooxindole unit is found in many natural products and biologically active molecules and 1,4-dihydropyridines are an important class of compounds with interesting biological activities such as vasolidator, antitumor, antidiabetic, bronchodilator and anti-atherosclerotic activities. Excellent yields and short reaction timesare related to the highefficiency of SBA-Pr-SO3H that the reactions take place easily in its nano-pores. Mild reaction conditions and easy work-up procedures are other advantages of this green method. Orru R.V., Ruijter E., “Synthesis of Heterocycles via Multicomponent Reactions II”, Vol. 2: Springer-Verlag Berlin Heidelberg, (2010). Gu Y., Multicomponent Reactions in Unconventional Solvents: State of the Art, Green Chem., 14: 2091-2128 (2012). Liang B., Kalidindi S., Porco J.A., Stephenson C.R.J., Multicomponent Reaction Discovery: Three-Component Synthesis of Spirooxindoles, Org. Lett., 12: 572-575 (2010). Bhaskar G., Arun Y., Balachandran C., Saikumar C., Perumal P.T., Synthesis of Novel Spirooxindole Derivatives by One Pot Multicomponent Reaction and their Antimicrobial Activity, Eur. J. Med. Chem., 51: 79-91 (2012). Lo M.M.C., Neumann C.S., Nagayama S., Perlstein E.O., Schreiber S.L., A Library of Spirooxindoles Based on a Stereoselective Three-Component Coupling Reaction, J. Am. Chem. Soc., 126: 16077-16086 (2004). Galliford C.V., Scheidt K.A., Pyrrolidinyl-Spirooxindole Natural Products as Inspirations for the Development of Potential Therapeutic Agents, Angew. Chem. Int. Ed., 46: 8748-8758 (2007). Deppermann N., Thomanek H., Prenzel A.H.G.P., Maison W., Pd-Catalyzed Assembly of Spirooxindole Natural Products: A Short Synthesis of Horsfiline, J. Org. Chem., 75: 5994-6000 (2010). Trost B.M., Brennan M.K., Asymmetric Syntheses of Oxindole and Indole Spirocyclic Alkaloid Natural Products, Synthesis, 2009: 3003-3025 (2009). Cheng D., Ishihara Y., Tan B., Barbas III C.F., Organocatalytic Asymmetric Assembly Reactions: Synthesis of Spirooxindoles via Organocascade Strategies, ACS Catal., 4: 743-762 (2014). Lashgari N., Mohammadi Ziarani G., Badiei A., Zarezadeh-Mehrizi M., Application of Sulfonic Acid Functionalized SBA-15 as a New Nanoporous Acid Catalyst in the Green One-Pot Synthesis of Spirooxindole-4H-pyrans, J. Heterocycl. Chem., 51: 1628-1633 (2014). Ball-Jones N.R., Badillo J.J., Franz A.K., Strategies for the Enantioselective Synthesis of Spirooxindoles, Org. Biomol. Chem., 10: 5165-5181 (2012). Goldmann S., Stoltefuss J., 1,4-Dihydropyridines: Effects of Chirality and Conformation on the Calcium Antagonist and Calcium Agonist Activities, Angew. Chem. Int. Ed., 30: 1559-1578 (1991). Morshed S.R.M., Hashimoto K., Murotani Y., Kawase M., Shah A., Satoh K., Kikuchi H., Nishikawa H., Maki J., Sakagami H., Tumor-Specific Cytotoxicity of 3,5-Dibenzoyl-1,4-dihydropyridines, Anticancer Res., 25: 2033-2038 (2005). Briede J., Stivrina M., Vigante B., Stoldere D., Duburs G., Acute Effect of Antidiabetic 1,4-Dihydropyridine Compound Cerebrocrast on Cardiac Function and Glucose Metabolism in the Isolated, Perfused Normal Rat Heart, Cell Biochem. Funct., 26: 238-245 (2008). Stout D.M., Meyers A., Recent Advances in the Chemistry of Dihydropyridines, Chem. Rev., 82: 223-243 (1982). Melero J.A., van Grieken R., Morales G., Advances in the Synthesis and Catalytic Applications of Organosulfonic-Functionalized Mesostructured Materials, Chem. Rev., 106: 3790-3812 (2006). Pouretedal H.R., Basati S., Characterization and Photocatalytic Activity of ZnO, ZnS, ZnO/ZnS, CdO, CdS and CdO/CdS Nanoparticles in Mesoporous SBA-15, Iran. J. Chem. Chem. Eng. (IJCCE), 34: 11-19 (2015). Mohammadi Ziarani G., Lashgari N., Badiei A., Sulfonic Acid-Functionalized Mesoporous Silica (SBA-Pr-SO3H) as Solid Acid Catalyst in Organic Reactions, J. Mol. Catal. A: Chem., 397: 166-191 (2015). Lim M.H., Blanford C.F., Stein A., Synthesis of Ordered Microporous Silicates with Organosulfur Surface Groups and Their Applications as Solid Acid Catalysts, Chem. Mater., 10: 467-470 (1998). Wight A.P., Davis M.E., Design and Preparation of Organic−Inorganic Hybrid Catalysts, Chem. Rev., 102: 3589-3614 (2002). Mohammadi Ziarani G., Faramarzi S., Lashgari N., Badiei A., A Simple and Clean Method for Multicomponent Synthesis of Spiro[indole-tetrahydropyrano (2,3-d)pyrimidine] Derivatives Using SBA-Pr-SO3H as Catalyst under Solvent-free Conditions, J. Iran. Chem. Soc., 11: 701-709 (2014). Mohammadi Ziarani G., Shakiba Nahad M., Lashgari N., Badiei A., Facile Microwave-Assisted Synthesis of 2-Aryloxazolo[4,5-b]pyridines Using SBA-Pr-NH2, J. Nanostruct. Chem., 5: 39-44 (2015). Mohammadi Ziarani G., Badiei A., Azizi M., Zarabadi P., Synthesis of 3,4-Dihydropyrano[c] Chromene Derivatives Using Sulfonic Acid Functionalized Silica (SiO2PrSO3H), Iran. J. Chem. Chem. Eng. (IJCCE), 30: 59-65 (2011). Mohammadi Ziarani G., Mousavi S., Lashgari N., Badiei A., Shakiba M., Application of Sulfonic Acid Functionalized Nanoporous Silica (SBA-Pr-SO3H) in the Green One-pot Synthesis of Polyhydroacridine Libraries, Iran. J. Chem. Chem. Eng. (IJCCE), 32: 9-16 (2013). Gholamzadeh P., Mohammadi Ziarani G., Lashgari N., Badiei A., Asadiatouei P., Silica Functionalized Propyl Sulfonic Acid (SiO2-Pr-SO3H): An Efficient Catalyst in Organic Reactions, J. Mol. Catal. A: Chem., 391: 208-222 (2014). Mohammadi Ziarani G., Badiei A.R., Khaniania Y., Haddadpour M., One Pot Synthesis of Polyhydroquinolines Catalyzed by Sulfonic Acid Functionalized SBA-15 as a New Nanoporous Acid Catalyst under Solvent Free Conditions, Iran. J. Chem. Chem. Eng. (IJCCE), 29: 1-10 (2010). Khalafi-Nezhad A., Mohammadi S., Magnetic, Acidic, Ionic Liquid-Catalyzed One-Pot Synthesis of Spirooxindoles, ACS Comb. Sci., 15: 512-518 (2013). Paul S., Das A.R., Dual Role of the Polymer Supported Catalyst PEG-OSO3H in Aqueous Reaction Medium: Synthesis of Highly Substituted Structurally Diversified Coumarin and Uracil Fused Spirooxindoles, Tetrahedron Lett., 54: 1149-1154 (2013). Khalafi-Nezhad A., Shahidzadeh E.S., Sarikhani S., Panahi F., A New Silica-Supported Organocatalyst Based on L-proline: An Efficient Heterogeneous Catalyst for One-Pot Synthesis of Spiroindolones in Water, J. Mol. Catal. A: Chem., 379: 1-8 (2013).